My Fiance had to drive an hour away to a mall near us to take back his iMAC to the Apple store due to it had issues so he told me to come along because its the only MAC closest to us. I had some birthday money (on a no buy otherwise trying to save funds) so I expected to maybe buy one thing myself. 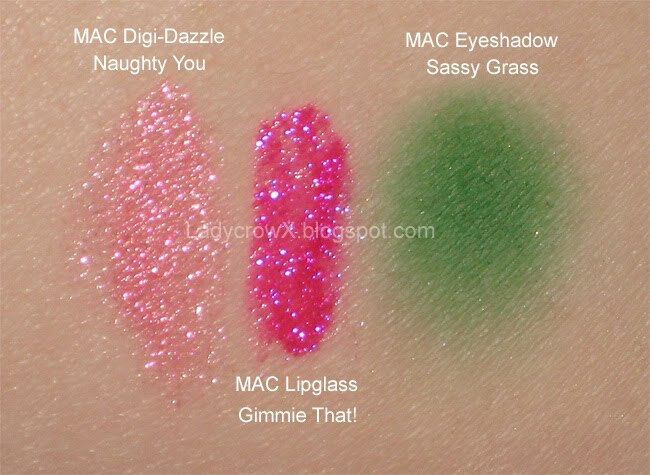 Anyway we got to the MAC counter and I swatched Gimmie That, and Sassy Green because those were what I was planning on buying myself...so he asked the lady to get them for me and while they were doing that I swatched a Digi-Dazzle lipstick in Troublemaker because I was curious about them. 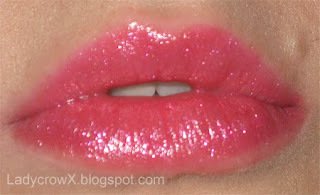 That collection didn't seem that awesome to me because I'm not much of a lip person...when I swatched Troublemaker though the fiance came back and I told him to look at how pretty it was (It had alot of tiny glitter in it making it sparkly). So he tells the lady to grab that too...I was shocked because he had said early he could get anything for me (he had already given me money before to spend online ordering makeup for my birthday) so I was shocked that he was buying me 3 MAC things lol. 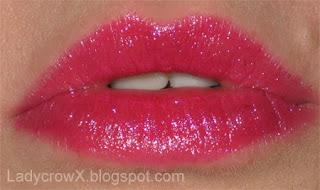 Swatched on my very pigmented lips below. Note: Pictures don't do the sparkles justice...they are much more sparkly irl. So very pretty! You have such gorgeous lips by the way, if that makes sense as a compliment!